The 63 Studebaker Avanti is included in American Cars of The 1960s by the auto editors of Consumer Guide – Take a trip down memory lane to "The Age of Aquarius" and a great Detroit decade. Vivid color photos, rare ads, and facinating brochure illustrations capture the glamour and excitement of America's 1960s cars. Forward – These pages celebrate an American industry and an American art form. 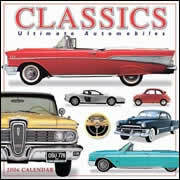 They trace 1960s automotive styling, as the guady look typical of 1950s Detroit gave way to more tasteful design. Car buyers changed too, and that led to new sizes and types of cars, particularly sporty performance models. Buy the book at Barnes & Noble Sample page photos compliments of Auto Editors of Consumer Guide, Publications International, Limited. 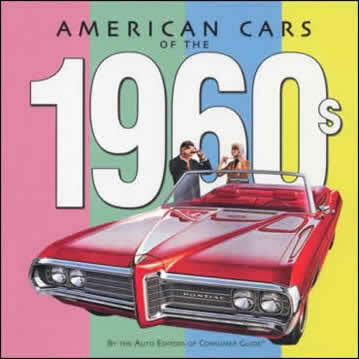 Pontiac Bonneville on American Cars of the 1960s cover. 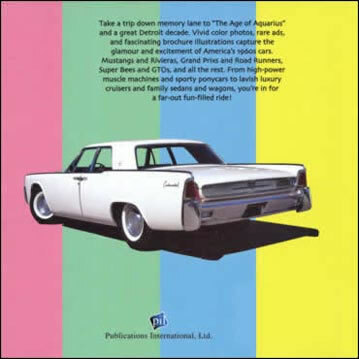 Back cover shows an early sixties Lincoln Continentals. 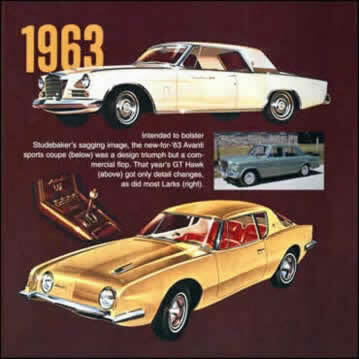 The 1963 Studebakers page with a Golden Hawk, Lark sedan and a gold Avanti. 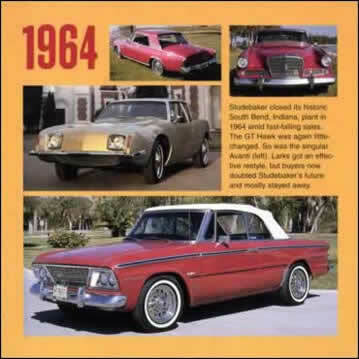 The 1964 Studebakers page with a Hawk, an Avanti and a red Lark convertible.